The Red Baron was off on a top-secret mission. Not even his closest assistant – that yellow bird that flew upside down – could know. He was flying above the fields close to headquarters. But the WWII veteran would stop him. He glided across the skies. What a skilled pilot he was! He landed safely on the airfield. Mission completed successfully. 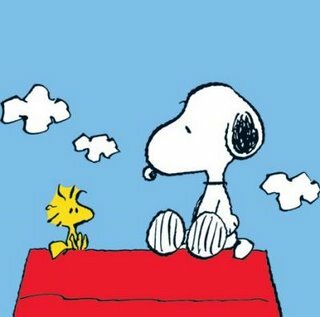 Snoopy got down from the roof of his shed. Woodstock was already swimming in his bowl – due to another crash landing. Snoopy turned around to the sound of fan-screams. “Hi Sweetie!” he said. “A dog in uniform is irresistible”, he thought. And alas, a crowd of Snoopettes appeared chasing after him!